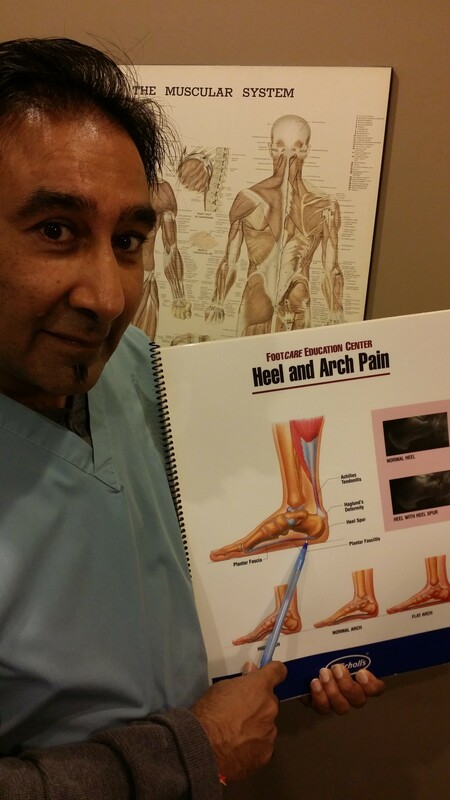 I often see patients complaining of heel spurs. More often than not, they have visited their family doctor, who have ordered x-rays and confirmed heel spurs as the cause of the heel pain and made referrals to me (Kiran Dave), as the specialist in foot disorders in Mississauga. Today, I wanted to share with you all the distinction between the many causes of heel pain. Patients who call my Mississauga health clinic with symptoms of heel pain usually require more time to evaluate, as often it is caused by a complex array of pathologies classified under the science of biomechanical dysfunctions. Although I am most often aware that the heel pain is not caused by heel spurs, as diagnosed by the family doctor with x-rays in hand, the condition still warrants a good biomechanical examination so as to not discount anything. (planter means the bottom of the foot and fasciitis means the inflammation of the planter fascia tissue). The Planter fascia is attached to the bottom of the heel bone and usually sustains strain in this area, secondary to bony structural compensations. Any stress injury stimulates repairs via inflammation, which is what causes the pain in the heel due to prolonged standing and walking. Most patients will complain of pain on getting out of bed in the morning or after sitting for a period of time. When a patient walks a little, they milk the inflammation out of the area and it actually alleviates some of their discomfort. It is important to make the distinction that heel spurs are formed as a result of chronic Planter Fasciitis, and often cause no pain, unless the bottom of the heel is severely aggravated. So what else could heel pains be caused from? There are many other reasons and pathologies that will elicit heel pain. Usually, by undergoing detailed history and examination, I can always diagnose the reasons accurately and formulate the correct treatment plan. Sub Calcaneal Bursitis mimics heel spur pains, but is another soft tissue injury. A bruised heel can also create pain in the heels, but usually this falls into the category of a sub calcaneal bursitis. Medial Planter Nerve Entrapment is also a painful heel condition, usually from soft tissue compressing the medial planter nerve. The symptoms are very different in the eyes of an experienced Chiropodist. Heel bone Hairline Fracture is another reason which is normally sustained from jumping or traumatic injuries. There are also some Cancerous growth elements that can,( but much rarer), also create heel pains. Growing pain in the back of the heels, amongst young boys between the ages of 9 to 13 can also suffer from heel pain from a condition called Severs Disease, which is a growth plate dysfunction. Pain in the back of the heel can be created by yet other soft tissue injuries labelled as Achilles Tendonitis, and/or Retro Calcaneal Bursitis. Most of the above conditions eliciting heel pains are created from faulty structural or biomechanical dysfunction of the foot, resulting possibly from other body structures such as knee, leg, hip or back. Treatment really depends on what the diagnosis is and what mechanisms are involved in eliciting the symptoms of pain. So much more is factored into making a unique treatment plan that works for the patient. Any of the selections of treatment are discussed and the patient educated, so that patient can make a full and informed decision as to what works best for them. More often than not, the patient selects orthotic devices, which are custom made using accurate techniques, and approved by insurance companies. Custom orthotics will help not only heal the foot, but also other symptoms, and so remains the favorite choice by many. Nonetheless, a good and thorough examination is still the determining factor. I would always suggest coming in as early as you can when you get any of the above symptoms, so that it can be accurately diagnosed and treated to prevent more advancing conditions that can stop you in your tracks. For example, when you have plantar fascial heel pains in one foot which are left unattended, it will eventually move into the other foot due to compensatory mechanisms. Referred pain can also continue to other structures. By having your feet checked early, I intend to help you prevent other larger issues, such as back, hip, knee, leg, and ankle pains. Get educated and informed about your feet, so we can help you take the right step forward. What are are Heel Spurs? A bony spur that projects from the back or underside of the heel bone (the calcaneus) and that may make walking painful. The walking is especially painful after a period of non weight bearing rest. Calcaneal spurs at the back of the heel are associated with inflammation of the Achilles tendon (Achilles tendinitis), and cause tenderness and pain at the back of the heel, which is made worse by pushing off the ball of the foot. Calcaneal Spurs at the bottom part of your heel bone under the sole (the plantar area) are associated with inflammation of the plantar fascia. 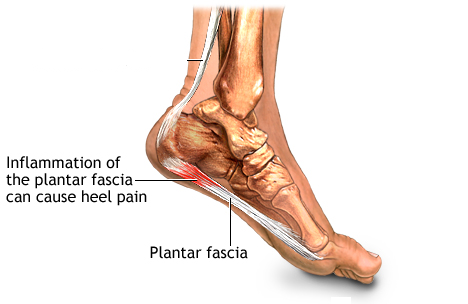 The plantar fascia is the bowstring-like tissue that stretches from the heel to the forefoot underneath the sole. These spurs can cause localized tenderness and pain that is made worse by stepping down on the heel. Calcaneal spurs and plantar fasciitis can occur alone, together, or they can be related to underlying diseases that cause arthritis, such as reactive arthritis and ankylosing spondylitis. In some cases, back, hip, knee and leg dysfunction can propagate heel pains or vise versa. What can be done about heel spurs? Treatment is originally designed to decrease the inflammation and avoid re-injury. It is commonly suggested that heel lifts can be used to reduce stress symptoms on the Achilles tendon and relieve painful spurs at the back of the heel. Also, donut-shaped shoe inserts can be used to take pressure off any plantar spurs. Infrequently, surgery is done on chronically inflamed spurs. However. most practitioners misunderstand and misdiagnose heel pains as heel spurs, when it is in fact planter fasciitis, so it needs to be looked at in a more holistic manner. Our chiropodist eventually finds that for people suffering with calcaneal spurs or and planter fasciitis, he is required to make prescription orthotics to control the very cause and not just the symptoms. He finds that the other recommendations for the spurs only have limited benefits and can allow the original cause to progress as they may not be addressing the original underlying cause. Our chiropodist suggests that it is always better to control the aetiology via good bio-engineered prescription orthotics. The approach is to do a full and extensive examination of the entire lower limbs, find the dysfunctional causes (and there is usually more than one cause), and educate the patient sufficiently, so that they can make an informed decision on what may work best for them.